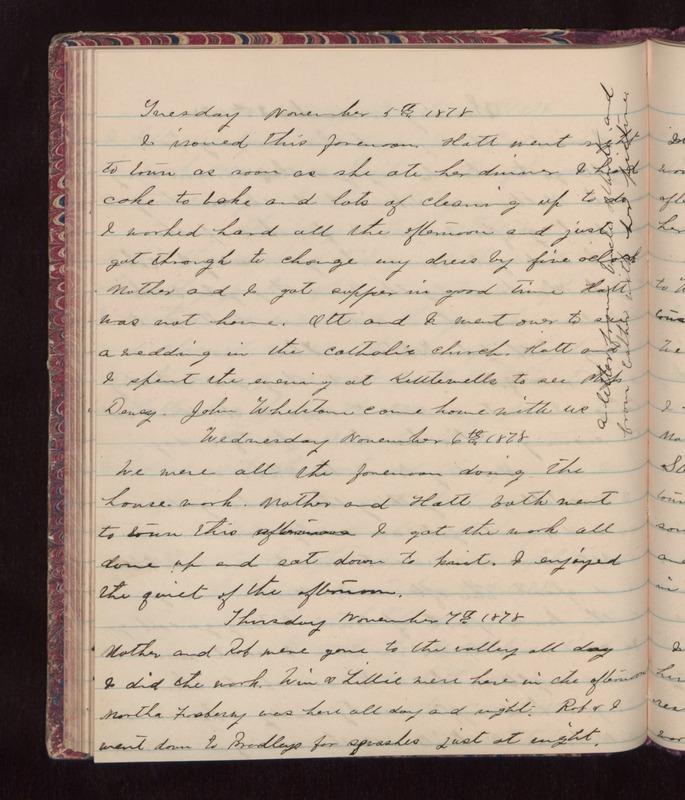 Tuesday November 5th 1878 I ironed this forenoon. Hatt went right to town as soon as she ate her dinner. I had cake to bake and lots of cleaning up to do. I worked hard all the afternoon and just got throught to cahnge my dress by five oclock. Mother and I got supper in good time. Hatt was not home. Ott and I went over to see a wedding in the Catholic church. Hatt and I spent the evening at Kettlewells to see Mifs Dency. John Whetstone came home with us. A letter from Uncle Albert and from Esther with her picture. Wednesday November 6th 1878 We were all the forenoon doing the house-work. Mother and Hatt both went to town this afternoon. I got the work all done up and sat down to knit. I enjoyed the quiet of the afternoon. Thursday November 7th 1878 Mother and Rob were gone to the valley all day. I did the work. Win & Lillie were here in the afternoon. Martha Forsberry was here all day and night. Rob & I went down to Bradleys for speeches just at night.